The Steelers fell to the Bears 40-23. “We’re frustrated, we’re disappointed, but we’re not going to lose our confidence. We’re going to have to put it together, and put it together fast.” — Ben, post-game. Five turnovers, two of them returned for touchdowns, doomed the Steelers to a 40-23 loss to the Chicago Bears, who held off a second-half rally by the home team to improve to 3-0. Despite those turnovers, they stormed back in the second half from three touchdowns behind to within four points early in the fourth quarter. But the Bears put them away quickly with a Jay Cutler touchdown pass to Earl Bennett and Julius Peppers’ 42-yard touchdown run with a Ben Roethlisberger fumble. It was Roethlisberger’s third of four turnovers, including another that went for a score when safety Major Wright ran an interception back. The loss ruined a big game by Antonio Brown, who caught nine passes for a career-high 196 yards and two touchdowns. He did not have to plead with any coach on the sideline Sunday night to get him the ball more often, but he was not satisfied, either. 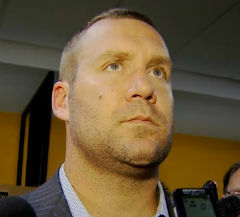 Roethlisberger topped 400 yards passing for the fourth time in his career. He completed 26 of 41 for 406 yards, his two touchdowns to Brown and two interceptions. That, too, was small consolation to him, as was how the offense stormed back in the second half. “I don’t know if we can’t dig out of it. We’re going to give it everything we’ve got to get out of it, it’s a deep hole, it’s getting deeper, but we’re not going to quit.” — Ben, when asked if 0-3 is too deep a hole to dig themselves out of. A lightning-strike, three-play drive that ended when Brown caught a 21-yard touchdown pass from Roethlisberger with one hand helped put the Steelers back into the game late in the third quarter. The Bears, who once led by three touchdowns, clung to a 27-20 lead as the drama entered the fourth quarter. Then, Shaun Suisham’s 44-yard field goal with 10:38 to go brought the Steelers within four, and it looked as though they might avert the 0-3 start. The game, then, ended much the way it had begun.